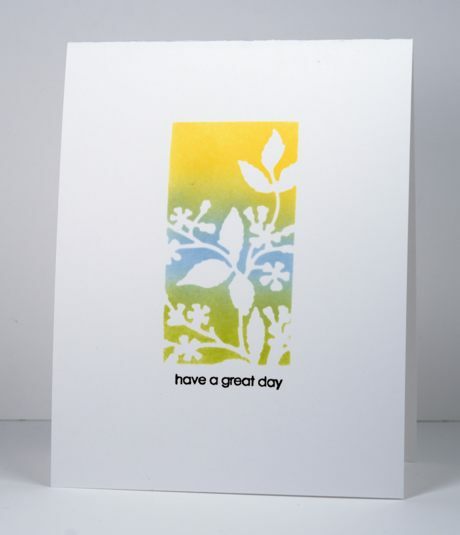 I can’t remember the last time I managed to participate in a challenge so I am happy to be posting a card for the One Layer Simplicity monthly challenge. The challenge is to blend something on your one layer card. I pulled out a new die called ‘framed flowers’ and used it to cut a mask. I added post-it notes all around the edges of the die cut mask so I would be left with just the rectangular image. My blending was done with memento inks and sponges, one of my tried and true techniques. My colour scheme was inspired by the current Runway Inspired Challenge #77, which is why I went for a black sentiment where I would usually just repeat one of the colours in my image. I like the black, it provides a nice contrast and I love the new set it came from, ‘snippets’ which has thirty-one little sentiment stamps. Thirty-one! Yay! I hope you get a chance to check out the entries on both challenges and get inspired to play along.